Has the roof on your home started to show signs of failing? Maybe you’ve noticed a stained spot on your ceiling and realize that you may have a roof leak. Whether you need a new roof installed on your home or a simple roof repair, Livingston Roof Pros is one of the best roofing contractors in Brighton Michigan to handle your roofing needs. We offer exceptional service and stand behind every project that we complete. 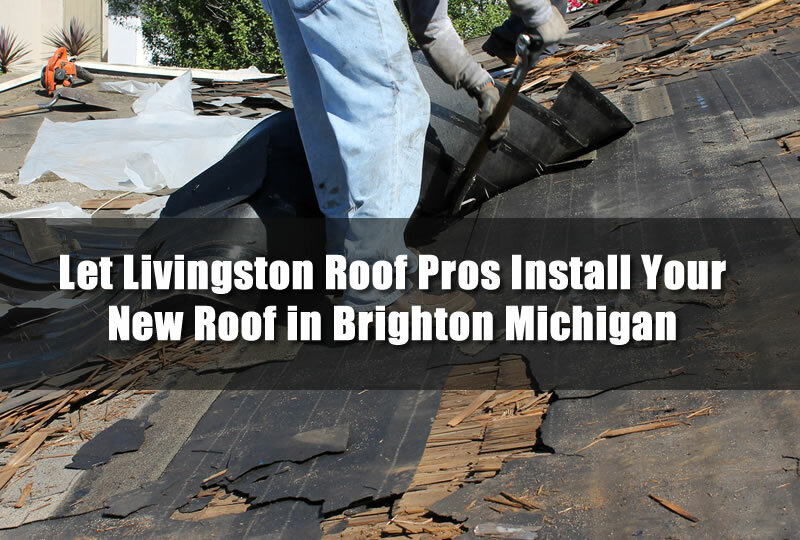 If you need a new roof in Brighton Michigan allow Livingston Roof Pros to install the roof for you and give you the peace of mind of having your home protected by a roof that was installed by properly qualified roofing experts at Livingston Roof Pros. Livingston Roof Pros is a roofing contractor that specializes in residential roofing repairs and installation. We offer many roofing services to ensure your home’s roof is correctly installed or repaired. Our customer service is second to none and we stand behind each and every project we complete. If you need a roofing contractor to install your new roof in Brighton Michigan be sure to call us today to set up an appointment. I’ll include some of the reasons why we’re one of the best roofing contractors in Brighton Michigan and surrounding areas. In order to ensure your roofing is installed per manufacturer’s specifications and also according to local building codes you’ll need to ensure you use a properly licensed roofing contractor. At Livingston Roof Pros we are fully licensed and insured so you get peace of mind and know that things are done the way they should be. Having a properly licensed roofer in Brighton Michigan also gives you a bit of assurance when you want to sell your home later. Faulty roofing installs can bring the value of a home down considerably so make sure you always use roofing contractors who are properly licensed and insured to work in the area. Having a properly licensed roofer in Brighton Michigan also gives you a bit of assurance when you want to sell your home later. Faulty roofing installs can bring the value of a home down considerably so make sure you always use roofing contractors who are properly licensed and insured to work in the area. At Livingston Roof Pros we realize that sometimes things can happen and usually it’s at the most in-opportunistic times. A tree can fall onto your roof or a storm can cause your skylight to start leaking. During these times having a roofing contractor who will come out and deal with the problem is huge. At Livingston Roof Pros we have emergency roofing experts always ready to help if you have a roofing problem at your home. We may be able to place temporary sheeting in order to protect the home from further damages then apply a more permanent fix the next day or so. Having lots of choices when it comes to your home’s roof means you’ll get exactly what you want at a price you can afford. We offer several different methods of installing a new roof in Brighton Michigan. The more economical choice is to use re-roofing and place a new roof over your home’s old roof. We also offer complete tear off and replacement of the old roof. While this may cost more it has many advantages and can ensure your roof lasts longer. We also have a huge selection of choices when it comes to roofing materials and are properly qualified in many different brands. For home owners who currently have metal roofing installed on their homes or they are considering adding metal roofing to their homes we can help to. We offer many different roofing material installations including asphalt shingles, metal roofing, and even rubber roofing. Most of the roofing materials used in Michigan today are covered by Livingston Roof Pros. Want more information on a new roof in Brighton Michigan? Be sure to contact us today to get a free roofing estimate in Brighton Michigan from Livingston Roof Pros.